The College at Brockport’s Allen Plaza will be landscaped with a green roof over the coming week. A living, planted roof system will be installed as part of a plan to improve site enjoyment and sustainability. The LiveRoof® Hybrid Green Roof System was selected for the green roof system, which was installed Tuesday, November 11 through Thursday, November 13. The Allen Plaza has undergone extensive restoration and enhancements since construction began earlier this summer. 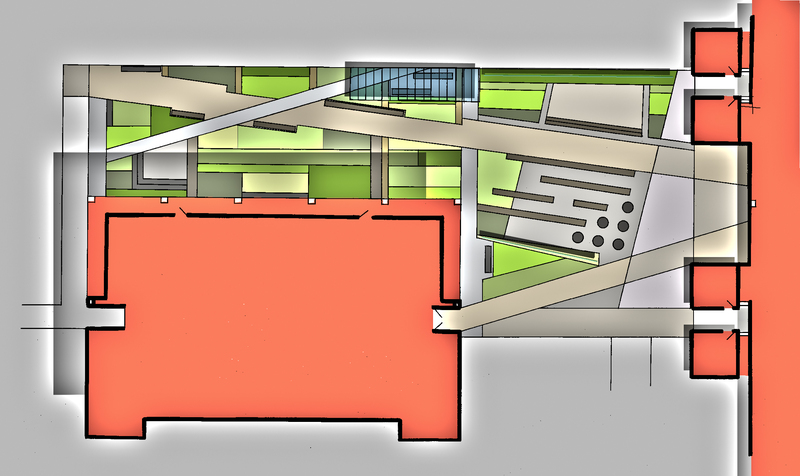 Renovations include addition of a drainage system for the deck surface, repair of damaged structural, mechanical and electrical components below the plaza, and addition of a covered walkway between Drake and Allen entrances. The site design by Flynn Battaglia Architects includes additions of seating and landscaped areas to improve the site’s accessibility and enjoyment by students, faculty and staff. 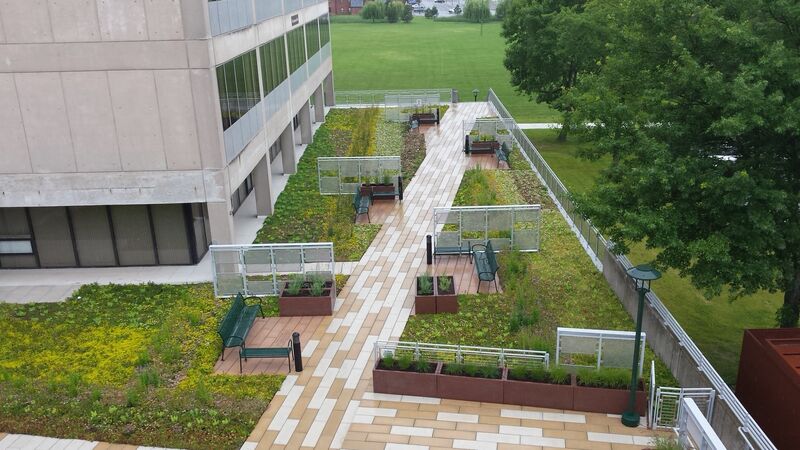 The College of Brockport’s Allen Plaza has undergone renovations including an accessible green roof. Rendering courtesy of JKLA, PC. “Green space is a high priority in our facilities development. The green roof is part of a renovation that reduces our environmental impact while expanding useful space,” said Robert Henry, Assistant Vice President for Facilities and Planning at the College at Brockport. 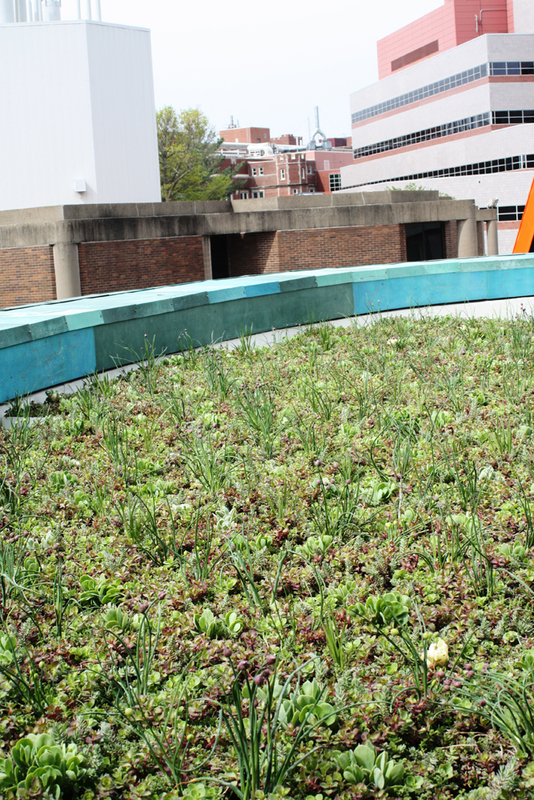 Allen Plaza’s new green roof has replaced approximately 70% of the impervious concrete surface with plants. 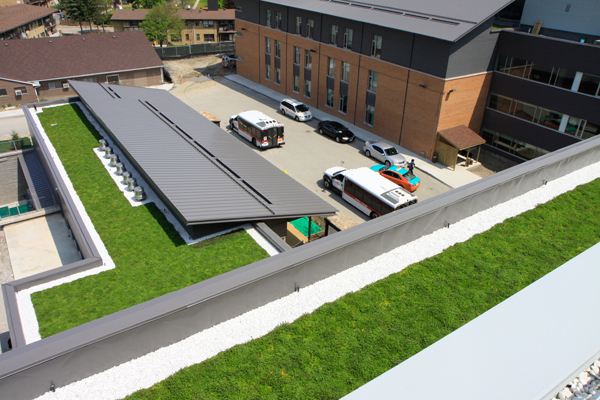 The modular green roof system was delivered fully grown by Corso’s Perennials, the regional grower for the LiveRoof system, and was installed by a collaborative effort between Leo J. Roth Corporation and R.M. Landscape. The green roof design and plant selection were completed by the firm Joy Kuebler Landscape Architect (JKLA). According to Corso’s, 35 different plant species are included in the green roof system which totals 5300 square feet in size. 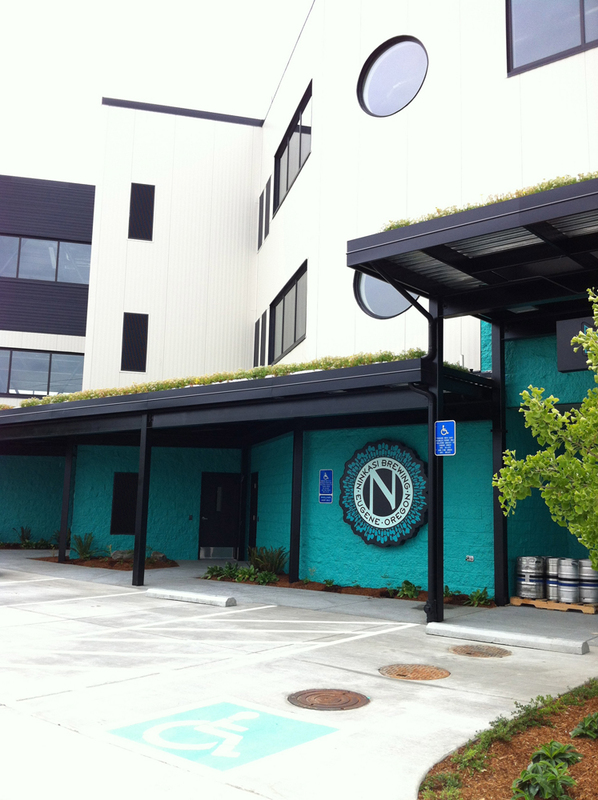 Ninkasi Brewing Company’s administrative building, opened in Eugene this summer, featuring a rooftop garden. A living, planted roof was installed as part of a plan to green the entire facility. 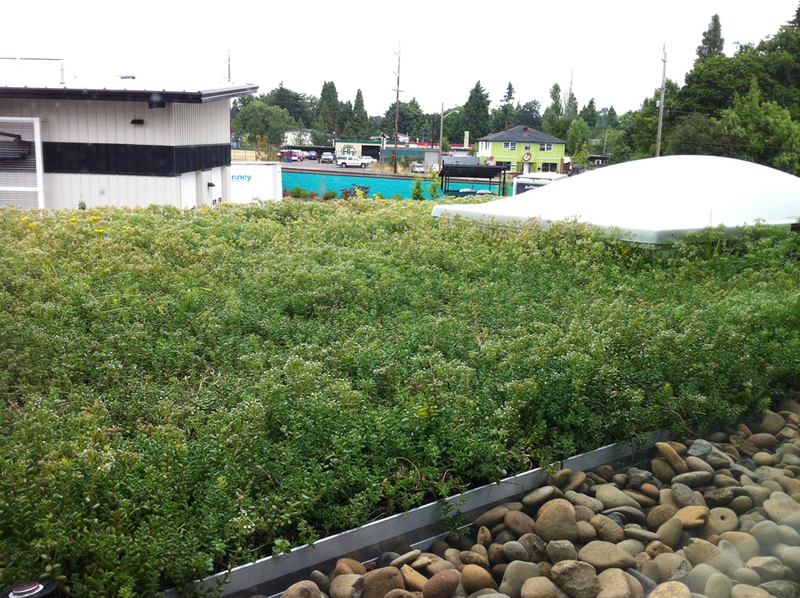 The LiveRoof® Hybrid Green Roof System was selected for the green roof system, which was installed this summer. The living roof reduces the total amount of stormwater runoff and filters pollutants that would otherwise be deposited in local streams, lakes, and rivers. Additionally, the green roof will moderate the temperature of runoff water, which minimizes its effect on local aquatic life. GreenFeathers, the regional grower for the LiveRoof system, grew and delivered mature flowers and greenery for the rooftop, which was designed by Cameron McCarthy and installed by Rexius. This new brewery is part of a larger growth project for Ninkasi, which includes a new local distribution facility and second brewhouse. All buildings are registered to be LEED® (Leadership in Energy and Environmental Design) certified under the new LEED campus platform. “This project has been very rewarding,” said Grace Dinsdale, president of GreenFeathers, Inc. “We knew that sustainability was a high priority for Ninkasi, and feel proud to have contributed to those efforts through use of recycled materials, locally sourced plants and soil, and sustainable growing practices.” The green roof is visible above the front entrance, and from windows throughout the facility. Kipling Acres, one of the City of Toronto’s ten long-term care homes, now features a planted rooftop of approximately 23,000 square feet. The living, planted roofs are part of a bird-friendly landscape design that will provide residents with improved access to nature. The LiveRoof® Hybrid Green Roof System was grown by LiveRoof Ontario, Inc. the regional grower for the LiveRoof system, and was installed by The Downsview Group. The redevelopment was designed by Montgomery Sisam Architects, and phase one construction was managed by Buttcon Limited. “The design of the green roof will be very popular with our residents, especially during the warmer weather, as the outdoor landscape includes bird-friendly features that will no doubt enrich residents’ quality of life,” said Nelson Ribeiro, Administrator of Kipling Acres. Vegetative roofs offer many benefits, including beautification, water management, air purification and improved energy efficiency. The city of Toronto is a leader in embracing green roofs for their contributions to stormwater management, and was the first North American to implement a by-law for green roofing. LiveRoof Ontario, Inc. has provided green roofs on other city-owned facilities, including City Hall’s Nathan Phillips Square podium roof and a number of Toronto Transit Commission stations. “This project was engaging for us, as we knew that it would have an impact on those who reside and work in the facility. 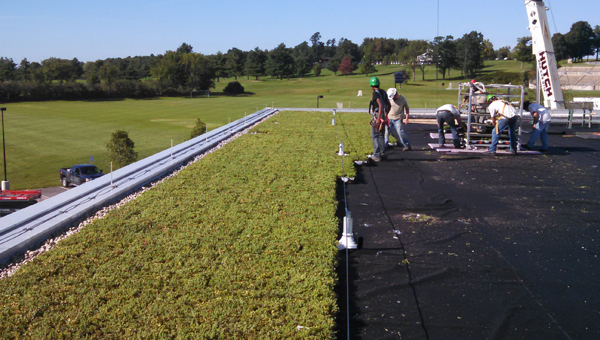 We started growing the project last year to ensure that the vegetated roof modules would be fully mature upon installation this spring,” said Peter Hillen, Owner of LiveRoof Ontario, Inc. The second phase of the Kipling Acres redevelopment will also include a planted roof of similar size. Kipling Acres is one of the City of Toronto’s 10 long-term care homes, and is being redeveloped with capital funding from the City of Toronto and with Ministry of Health and Long-Term Care, as part of the Ontario government’s long-term care home renewal strategy. The new home offer 192 long-term care beds in private and semi-private rooms that are spacious and wheelchair accessible. Kipling Acres serves seniors and a large number of young adults. The renovated headquarters of Raven Industries will soon be housed under plants. Over the next two days, a living, planted roof will be installed as part of a plan to green the entire facility. The LiveRoof® Hybrid Green Roof System was selected for the green roof system, which will be installed on April 15-16, 2014. The modular green roof system bill be delivered fully grown by Bachman’s, Inc. the regional grower for the LiveRoof system, and will be installed by Architectural Roofing & Sheet Metal. “The facility has been operational over fifty years, and we want to honor the building’s legacy by making sustainable design and product choices which reduce operating costs and stand the test of time,” said Brian Meyer, Raven’s Chief Information Officer. 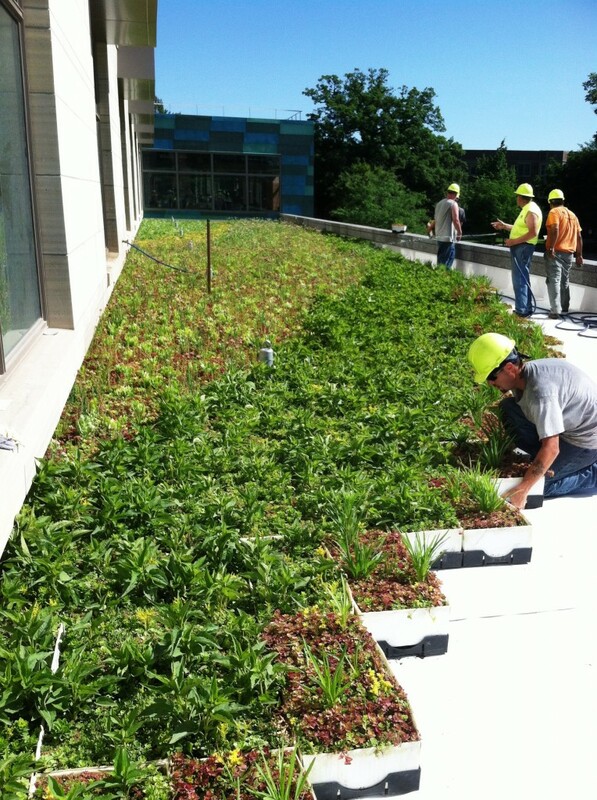 “We selected regionally adapted plants that will be delivered mature, thriving, and ready for the rigors of the rooftop environment,” said John Daniels, Vice President of Bachman’s of Minneapolis, Minn.
Green roofs offer many benefits, including, beautification, water management, air purification and improved energy efficiency. The LiveRoof green roof system contributes toward the credits needed to acquire the LEED certification anticipated by the design and construction team. The LEED program is the nationally accepted benchmark for the design, construction and operation of high performance green buildings. Certified LEED buildings cost less to operate and are a test to the values of the organization that own and occupy them.